To many people, owning a home in the United States is seen as the ultimate financial goal. But if you’re planning to do so as a non-U.S. citizen then there can sometimes be additional requirements beyond those for U.S. citizens that are important to know about before you get into the home-buying process. In this article, we’re going to outline some of the documents that are needed in order for non-citizens to apply for a mortgage, how your visa classification can impact whether mortgage financing is available to you or not, the importance of having a social security number, and why you need to build your credit history as a non-U.S. citizen. One of the first challenges you’ll face as a non-U.S. citizen is gathering the right documents. Lenders may have varying policies regarding what documents are required in order to apply for a mortgage, so it’s important to work with a lender that clearly outlines what is needed and is willing to help you every step of the way. That’s one of the main reasons why you choose a mortgage expert consultant such as A and N Mortgage, as they have a long history of working with non-U.S. citizens seeking to buy a home. If you’ve immigrated to the U.S. as a permanent resident, then you can apply for a mortgage in the same way a U.S. citizen would be able to. However, you do need to be able to prove your residency status in the U.S. Documents such as a green card, employment authorization card, or a valid visa and foreign passport can be used. If your documents are soon to expire, then it’s important to renew your documents in preparation for the mortgage process. Similarly, if you’re considered a conditional permanent resident, then you can apply in a similar fashion but you must be able to provide an unexpired two-year green card or an unexpired foreign passport with a temporary I-551 stamp which serves as an endorsement for permanent residence for a year. For immigrants who are not citizens or residents but were granted asylum, it’s possible to work and obtain financing much like a resident of the U.S. You must be able to prove that you are a refugee or have been granted asylum status. The process of applying for a mortgage can be complicated, so it’s important to speak to a mortgage expert if you’re in need of assistance. A specialist can help you with procedures related to applying for your first mortgage. Before entering the U.S., you’ll often need to apply for a visa in order to enter the country. Depending on your visa classification, you’re afforded certain benefits and may be limited in what you’re able to do. For instance, a government official that is granted diplomatic immunity technically cannot qualify for a mortgage because they are not subject the U.S. law. 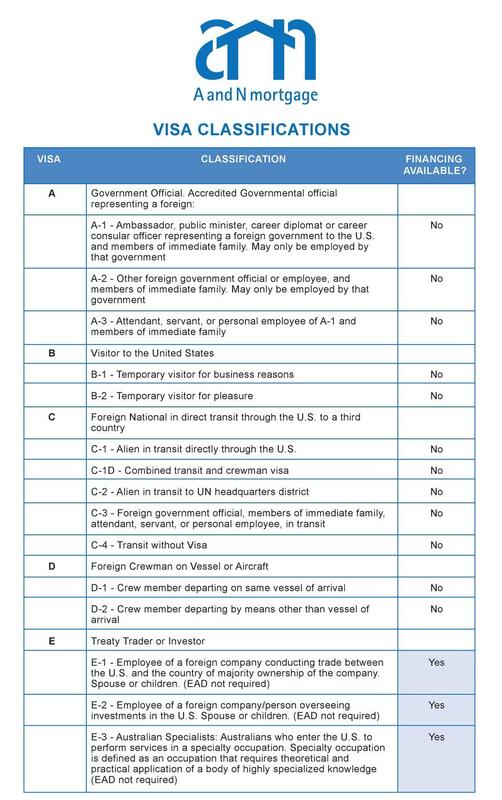 This is often known as a Class A visa and is often given to ambassadors, diplomats, and other officials traveling in the country. On the other hand, those with a Class E visa are able to secure a mortgage. This visa type is given to those who are employees of a foreign country that conduct trade in the U.S. or employees of a company or person that are overseeing investments in the U.S.
A full list of visa classifications and their eligibility for a mortgage can be found in the attached PDF below. It lists every single visa type, the classification, and also if financing will be available to those individuals. Class F visas are given to academic students and foreign medical graduates. Classifications F-1 and F-2 are also in the same category with F-1 defined as foreign students that must return home after their studies and F-2 defined as the spouse or children of an academic student. Academic students with a Class F visa will not be able to secure a mortgage regardless of their classification. If you have a Class F visa but have been granted an Employment Authorization Document, then it is possible to qualify with this status. As for Class H visas, eligibility for a mortgage will depend on the sub-classification. For example, visas of Class H-1B, H-1C, H-2A and H-2B will be eligible for a mortgage. However, trainees with a Class H-3 visa and the spouse or the child of someone with an H-1 to H-3 Class visa will not be eligible. Despite temporary workers with Class H visas being eligible for a mortgage, Class B visa holders that are defined as a “visitor to the United States” cannot secure a mortgage even if they possess a Class B-1 visa that is defined as a “temporary visitor for business reasons”. Although Class B-1 and Class H visas are both defined as “temporary”, their classifications are different. The “business reasons” definition for Class B-1 is considered too vague and will not suffice when securing a mortgage. This is one of the reasons why it’s important to fully understand your visa classification so that there are no confusions regarding your eligibility to purchase a home as a non-U.S. citizen. Class O-1 visas are given to those who possess “extraordinary ability in sciences, arts, education, business or athletics” and will be eligible for a mortgage. Interestingly, assistants to O-1 visa holders (classed as O-2 visa holders) are also able to secure a mortgage as a non-U.S. citizen and the spouse or child (classed as O-3 visa holders) can also seek a mortgage. This is different from other visa classifications were those associated with someone eligible for financing cannot secure a mortgage such as Class H and Class L.
If you’re unsure about your visa classification or how to proceed, then you should consider contacting us at A and N Mortgage so we can help explain the various visa classifications and if you’ll be eligible for a mortgage. If you’re not a citizen of the U.S, you will need to have a Social Security number in order to apply for a mortgage. You can apply for a Social Security number in a variety of ways, such as applying in your home country before moving to the U.S. or by visiting a Social Security office in person. Having a Social Security number is also important if you’ve recently entered the U.S. This is because you won’t have any credit history and you’ll have to build it up again as a non-U.S. citizen. With a Social Security number, you’ll have an easier time identifying your credit history which is linked to this unique number. Once you can prove your identity and immigration status, you can then fill out an application form for a Social Security card (Form SS-5) and submit it to the office. As a non-U.S. citizen that is applying for residency, you’ll have no credit history and you’ll need to build it up if you want to be eligible for a mortgage and be offered better rates. To do this, you’ll have to obtain a Social Security number so that your credit file can be identified as yours. It’s the only way to have a unique identification that ties you and your file. Building a credit rating will not only help you get a mortgage in the U.S, but it will also make other aspects of life easier such as obtaining financing for other items. Ideally, a two-year credit history within the U.S. is needed along with a good credit score. Some lenders will allow you to use your credit history form a reputable foreign credit reporting agency. Or you may be able to prove your creditworthiness by providing verification from foreign creditors. Exceptions can be made to the two-year history, so please contact an A and N Mortgage loan officer to discuss this. From explaining visa classifications to detailing mortgage options available to you, our team of specialists at A and N Mortgage is here to help. 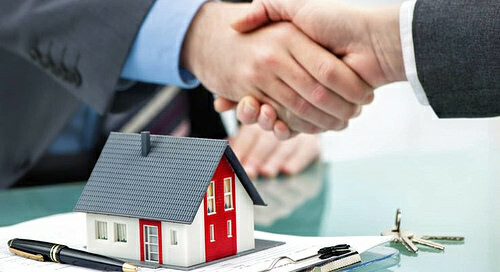 We understand that there are many challenges in navigating the mortgage landscape as a non-US citizen. With competitive rates and a vast amount of products and services, we have everything you need. We offer mortgages in Chicago (our headquarters) and are in nine states and growing.